The Metro MBQ-180-QH insulated and heated banquet cabinet with Quad- Heat system is packed with useful features that will enable you to achieve great results every time! Perfect for hotels, banquet facilities, or any type of food service operation where food is prepared in one location and must be time-temperature controlled! A reliable, high- performance 1650 watt heating module provides stable, even temperature regulation with a dial thermostatic control. The heating module's high-temperature ball bearing blower motor is designed for years of trouble-free service. The patent-pending Quad-Heat system combines the standard heating module with a canned-fuel backup system for the most even, easy-to-control heating possible. The system consists of three elements. First, there are two sliding drawers which each hold two cans of fuel (for a total of four). These drawers are accessible when the main doors are closed to reduce heat loss. These drawers slide into the second element, the radiator. This radiator holds the drawers and canned fuel firmly in place (no sliding or spilling), and dissipates the heat of the canned fuel evenly, eliminating hot and cold spots, and preventing any safety issues associated with an open flame. The third element is the four corner chimneys that direct the hot air from the radiator up and around the food for a uniform temperature. You can use the Quad-Heat system in conjunction with the standard electric heating system, or by itself, depending upon the availability of power! All important information can be found at a glance on the exterior of the Metro MBQ-180-QH heated banquet cabinet with Quad-Heat. An easy- to-read externally-mounted thermometer will help you keep an eye on the internal temperature, and a dual-function timer that will count up or down gives you an added measure of control for great results. Finally, a combination white board / clip board will allow operators to check contents, instructions, and other relevant information quickly and easily. 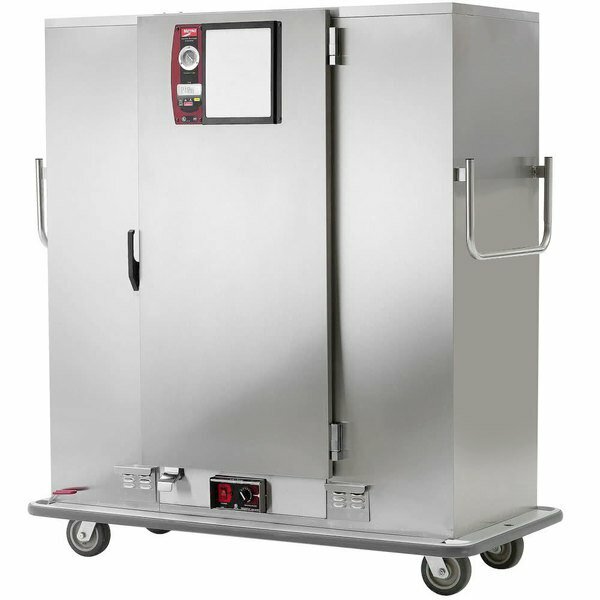 The Metro MBQ-180-QH is constructed from welded and reinforced stainless steel, with 1" of high-density fiberglass insulation to keep heat inside the cabinet. The doors are sealed with high- temperature Santoprene gaskets and are insulated as well. This heated banquet cabinet is easy to maneuver and stable thanks to its heavy-duty 6" diameter, 2" wide polyurethane casters. Two of these casters are fixed, and two swivel and have brakes. Plus, the three-point control handle is ergonomically designed for pushing or pulling. Don't worry if your hands are full, a standard kick-latch provides access to the cabinet! The Metro MBQ-180- QH has 3 nickel-chrome plated, removable wire shelves. 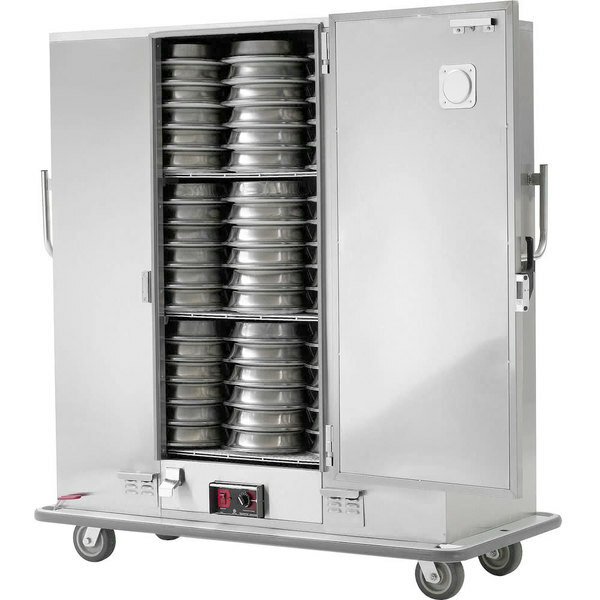 It has a maximum capacity of up to 180 stacked 11" diameter plates. 120V, 13.8 amps. Shelf Size: 55" x 22"